French “pharmacie” is finally making big headlines in the UK. Previously, only savvy beauty bloggers were raving about the wonders of Parisian pharmacies, but with more and more brands being available in British stores, every lifestyle magazine features at least one monthly article on beauty finds from the likes of Avene, Bioderma and Caudalie. Now, Nuxe is still a relative newcomer, which makes it particularly good for surprise gifts. 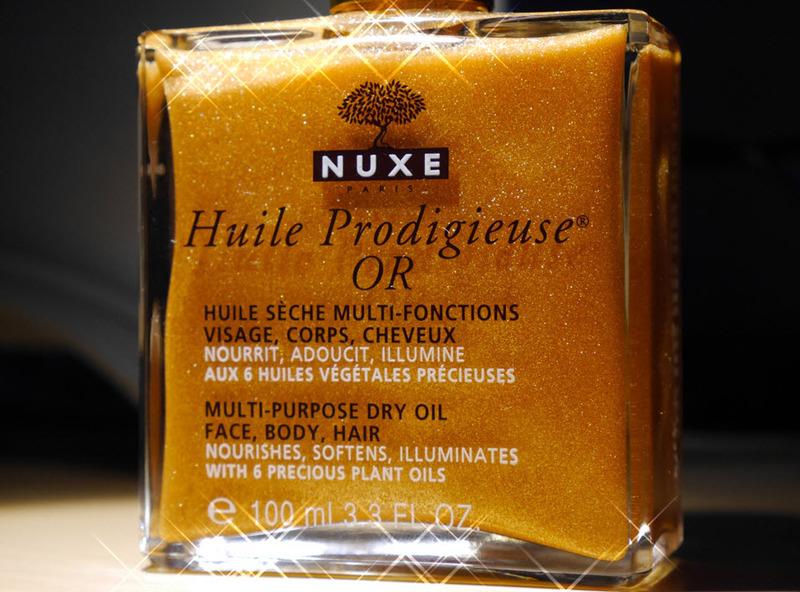 Their top product is Huile Prodigieuse (or for the less fancy ones like myself, simply “dry oil”) – it comes in two versions – with or without golden shimmer. I’d say shimmer is more versatile and looks more expensive. It’s available from many online shops with free delivery, just check here and here (I got mine at Marks & Spencer). Girls/women who like their nights out. The golden shimmer looks particularly good in dimmed settings no matter what skin colour you have, so it’s absolutely perfect for romantic dinners and clubbing. I hear ya! That’s the best part, actually – it’s totally “dry” (I believe it says so on the bottle itself). Sounds quite bizarre for an oil-based product, I know, but it really does sink in so quickly that you don’t need to worry about it greasing your clothes (remember those dreadful days when fake tan just sat on top of your skin and ended up everywhere from your favourite white dress to bed sheets and towels…argh!). Yep, many times, from rainy London to sunny Seychelles 🙂 It doesn’t add any unnecessary shine on photos, so you won’t end up looking like you just had a sweaty workout. The only watch out is hair – Nuxe claims that this oil is totally universal and can be used anywhere, but I found that it did make my hair look a bit dirty (my hair is straight and heavy), so I’d recommend to use it only if your hair is on the drier side. Have you had any great experience with French beauty brands? What’s your winner? Next PostAmazing gifts for One Direction fans (and haters)… Take your pick!